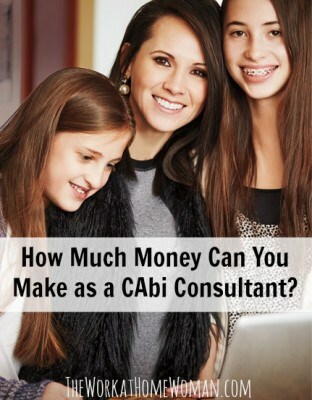 How Much Money Can You Make as a CAbi Consultant? You are here: Home / Direct Sales / How Much Money Can You Make as a CAbi Consultant? It’s no secret that I adore CAbi. I fell in love with the brand in July of 2010 when I attended my very first CAbi Scoop (their bi-annual fashion show that reveals the new season’s line of clothing). At first, it was the clothing and the high energy fashion show that pulled me in, but after being around the exuberant consultants and hearing their stories of success, I knew that CAbi was so much more. These women are energetic, caring, happy, and confident — but most of all they’re having fun while making money from home. According to the Direct Selling Association (DSA) the median gross annual income for a direct seller is $2,420. The average annual income for a CAbi Consultant (2011) was $19,031. CAbi Reps can make 20% – 33% commission based on personal sales and team building bonuses. But what does this translate to in terms of real-life CAbi Consultants? With CAbi you make money in three different ways. 1) Host home shopping parties and earn 25% to 33% commission on items you sell. 2) Build a team and receive an additional commission on things that your team sells. 3) Sell your inventory at the end of the season for 50% off. If you sell 70% of your inventory, you'll earn $3,000+. Here are two examples of women in different stages of their CAbi careers and how much they're earning. Now if you're anything like me, you'll want to break this down further. How much time do I have to devote to my business? Each of these women are hosting four shows a month — which seems extremely reasonable. Let's say that's one show a week. Allow two hours for driving, set up, and take down. Allow three hours for the show and two hours for administrative tasks, like entering orders. That's a total of seven hours a week or 28 hours a month. Even if you double (56 hours a month) or triple (84 hours per month) the number of shows you're doing each month, you'll still have lots of time to spend with your family — which is why so many women want to work from home in the first place. How easy is it to sell clothes? Recently, Forbes Magazine cited research done by Rent the Runway that found women on average buy 64 new pieces of clothing each year. So not only is this a hot niche to be involved with, CAbi's clothing prices are comparable to department stores like Nordstrom — which means you'll have higher overall sales. Last spring I hosted a CAbi party, and only three friends could make it. Even with this low turnout, my CAbi Consultant still sold $1,200 in clothing (this did not include the discounted hostess items I purchased). And every time I've hosted a CAbi party, at least one friend or a family member has signed on to host a show as well. One last point. Whenever I wear CAbi clothing, I almost always get a compliment on what I'm wearing; seriously! If you attend a show and try on the clothes — you'll more than likely become a CAbi fan! 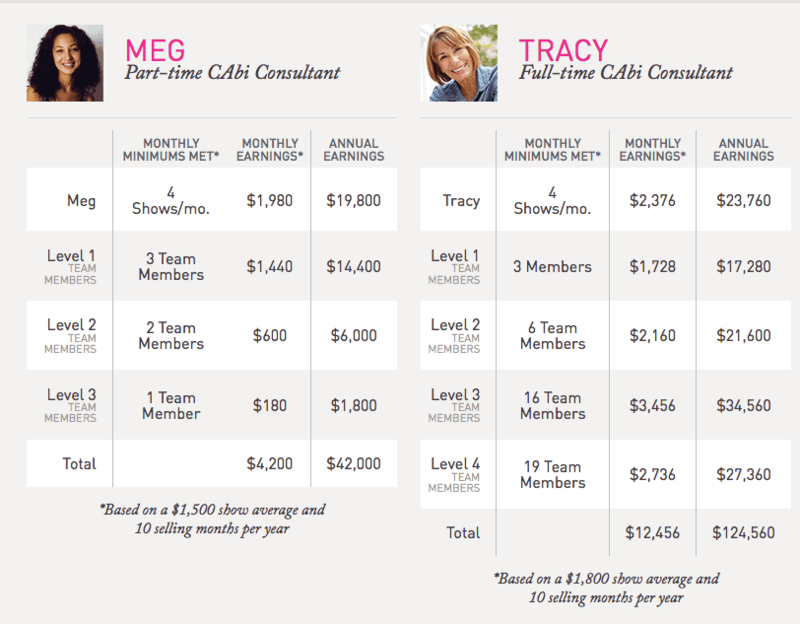 Want to see how much you can earn as a CAbi Consultant? Come try out the CAbi Calculator and see how much you can earn hourly, monthly, and annually. Has this piqued your curiosity? You can get a glimpse of the CAbi experience below, or you can host or attend a show to get a better feel for the brand. And if you're ready to launch your own home-based fashion business, you can get started here. Images courtesy of CAbi. Used with permission. This post was sponsored by CAbi. Please be aware that we can only promote advertising from companies that we feel we can legitimately recommend to our readers. For more information, please see our disclosure policy. I am in the USA and would like to have some more detail for joining. Thank you! Excellent — now is the perfect time to get involved with cabi! If you’re approved, you will start out as a Stylist for their Fall 2018 season. They also have an Apprentice Program where you can get some practice now. Hi please contact me. Im based in Johannesburg, South Africa. Right now, cabi is only available to residents of the US, Canada, and the UK. What’s the set up cost to be a cabi consultant? Seasonal inventory costs $2,570, and according to their website, if you sell 70% of your seasonal inventory at 50% off, you’ll make $3,000+ which would be enough to purchase the upcoming season. Thanks for sharing this career opportunity. This is perfect for anyone who wants to work in the fashion industry. I’m sharing this now.